Winston Road is a 2-storey mid-Victorian terraced house in Stoke Newington. The client’s brief was to extend the kitchen to the side including replacement of an existing lean-to structure to provide a generous and well-lit space for cooking, eating and living. The client also asked for a facility to enable them to hang and water their orchids on the new rear facade. The project includes some hard landscaping to the back garden and a fully refurbished first floor bathroom. 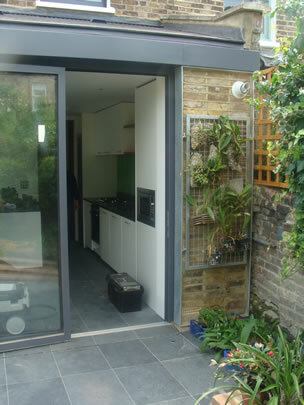 External materials used on the extension are slate effect tiles combined with reclaimed, stack bonded London stock bricks in galvanised steel frames, with removable galvanised steel mesh panels to hang the orchids from. Internal finishes include slate, oak, coloured glass and sprayed mdf panels.